These muffins can be made fresh for breakfast (or brunch), or the night before as they keep for up to three days in a cake tin. Each serving provides 190 kcal, 5g protein, 33g carbohydrates (of which 13g sugars), 5g fat (of which 1g saturates), 1.5g fibre and 0.5g salt. Preheat the oven to 200C/180C Fan/Gas 6 and line a 12-hole muffin tray with large muffin cases. Place the honey into a small non-stick saucepan over a medium heat and heat for 2–3 minutes or until it turns a dark golden-brown and just begins to smoke. Stir in the apples and spices and cook for 3–4 minutes, or until slightly softened. Remove from the heat and set aside to cool. Beat together the eggs, sesame oil and milk in a bowl. Mix in the mashed bananas. In a large bowl, stir together the flour, sweetener, bicarbonate of soda and raisins. Make a well in the middle and pour in the egg mixture. Stir in the apples and any liquid from the pan. Spoon into the muffin cases. 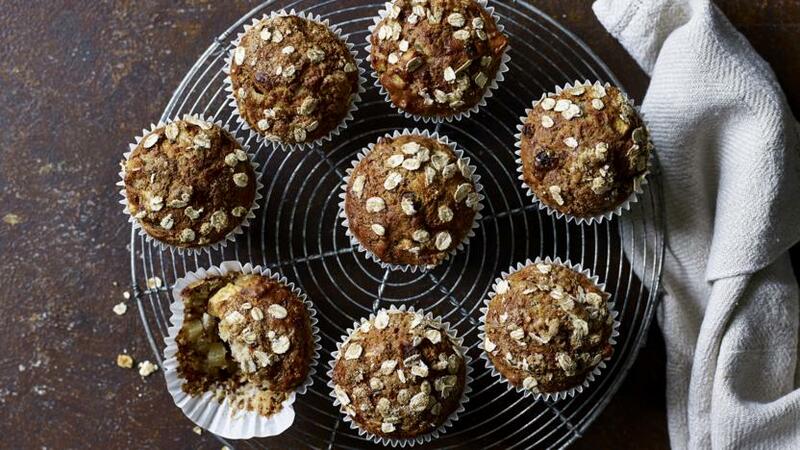 Mix together the oats and sugar and sprinkle on top of each muffin. Bake for 20 minutes or until a skewer pressed into the centre comes out clean. Cool on a wire rack and eat warm or keep in a airtight container for up to 3 days and warm for 5 minutes at 200C/180C Fan/Gas 6.